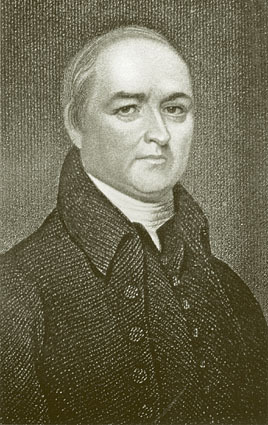 Timothy Dwight was married to the 1st cousin of Henry's wife, Sarah Welles. Dwight performed the funeral service for Henry's father-in-law, Rev. Noah Welles, as well as for Henry's wife, Sarah. Dwight, Timothy, educator, was born in Northampton, Mass., May 14, 1752; son of Maj. Timothy and Mary (Edwards) Dwight; grandson of Col. Timothy and Experience (King) Dwight, and of Jonathan and Sarah (Pierpont) Edwards; great-grandson of Nathaniel and Mehitable (Partridge) Dwight; great-great-grandson of Capt. Timothy and Anna (Flint) Dwight, and great-great-great-grandson of John and Hannah Dwight of Dedham, the immigrants, 1634-35. He was graduated at Yale in 1769, sharing with Nathan Strong the honors of the class. He was principal of Hopkins grammar school, 1769-71; tutor at Yale, 1771-77, during which time he studied law; was [p.360] licensed to preach in 1777 and served as chaplain in Parson's brigade of the Connecticut line, 1777-78. The death of his father called him home and he took charge of the farm, occasionally preaching in the neighborhood churches, 1778-83. 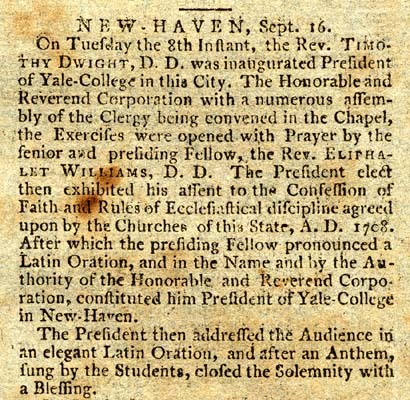 At the same time he conducted a day school and while New Haven was in the hands of the British, he had under his care several of the refugeed Yale students. He was a representative in the Massachusetts legislature, 1782, and refused a nomination as representative in congress. He was pastor of the church at Greenfield Hill, Fairfield, Conn.,1783-95, and established there his celebrated academy and became the pioneer of higher education of women, placing both sexes on an equal footing in his school. 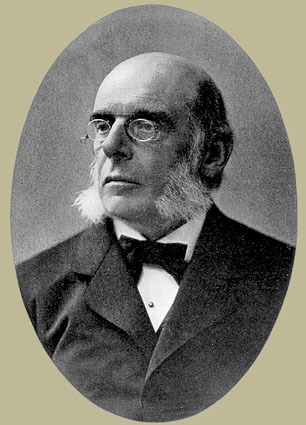 During this period he secured the union of the Congregational and Presbyterian churches in New England. He was president of Yale college from Sept. 8, 1795, to Jan. 11, 1817, and Livingston professor of divinity pro tempore, 1795-1805, and by election, 1805-1817. He found the college with a narrow and pedantic curriculum, with the bitterest of feeling existing between the freshmen and the upper-class men, and between the students and the faculty, and with the burden of a primary system. These he reformed, and at his death the 110 students had increased to 313 and the college had taken rank as one of the model university schools in America. He was married in March, 1777, to Mary, daughter of Benjamin Woolsey of Long Island and they had eight sons, the eldest of whom, Timothy (1778-1884), was a merchant in New Haven and gave $5000 to endow the Dwight professorship of didactic theology at Yale. He received from the college of New Jersey the degree of S.T.D. in 1787, and from Harvard that of LL.D. in 1810. His master dissertation was: History, Eloquence and Poetry of the Bible; while a chaplain in the army he wrote the patriotic song Columbia; his most ambitious work was his epic The Conquest of Canaan and his most popular pastoral poem was Greenfield Hill (1794). 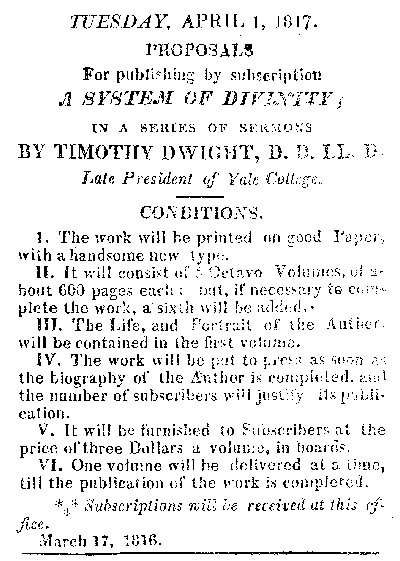 He revised Watts's Psalms with additions of his own and made a selection of hymns, introduced in the worship of the Presbyterian churches by the General assembly. His published books include: Travels in New England and New York (4 vols,, 1821); Theology Explained and Defended in a Course of 173 Sermons (5 vols., 1818); The Genuineness and Authenticity of the New Testament (1793); Discourse on the Character of Washington (1800); Observations on Language (1816); Essay on Light (1816). 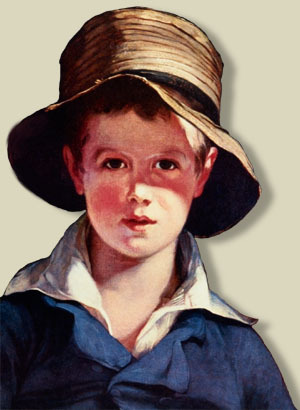 He died in New Haven, Conn., Jan. 11, 1817. The sinner's heart with hell's alarming sound. Nor in his heart nor sermons found a place. Guild hell-deserving, and forgiving love. Snug in my nest shall live, and snug shall die."